Nestled on a hillside in Huntington County, Two-EE’s Winery is a relatively new vineyard. It was established in 2013 by Eric and Emily Harris. Eric is the head winemaker and within the first 18 months of opening, he was recognized twice as a rising star of his trade. 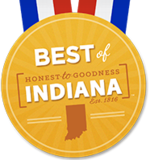 Voters had many other award-winning wineries to choose from and they named Two-EE’s Winery in Roanoke the Best Winery Experience in Indiana. Oliver Winery (Bloomington) and Country Heritage Winery and Vineyard (LaOtto) rounded out the top three. Waterfalls are one of nature’s most beautiful attractions and online voters named Cataract Falls near Cloverdale as their favorite. Located on Mill Creek, an upper and lower set of falls combine to create a cascade of water, dropping 86 feet. The view from Cataract Falls Covered Bridge is picturesque. Other top vote-getters in this category were Big Clifty and Tunnel Falls at Clifty Falls State Park (Madison). Indiana is home to more than 100 waterfalls and the winter and spring months reveal these natural wonders at their best. From blues to folk, music fans have spoken. Bean Blossom Blues Fest started as a small gathering for harmonica musicians and now brings the best in blues to the lovely rolling hills of Brown County. The festival is three days of big-name performances. Indiana is known for having a lot of festivals and the competition was close in this category. Voters picked the free, one-day, Ferdinand Folk Festival as their second favorite music festival, followed by the Hyperion Music and Arts Festival in Spencer. Nominees for all three categories were recommended by members of Indiana’s travel, tourism and hospitality industry. The public could vote for up to five nominees in each category. VisitIndiana.com/Fall is a companion site to VisitIndiana.com, the official state travel website where discounts, trip ideas and helpful tips are easily accessible. Lt. Governor Eric Holcomb oversees the Indiana Office of Tourism Development (IOTD). Mark Newman serves as the agency's executive director. IOTD is dedicated to enhancing the economic vitality of Indiana through leadership and resource support to the Indiana travel industry. The tourism and hospitality industry is the sixth largest industry in the state, is directly responsible for 144,200 jobs, generates over $2.25 billion in tax receipts and contributes $10.7 billion in revenue to Indiana businesses. For more information: www.VisitIndiana.com.